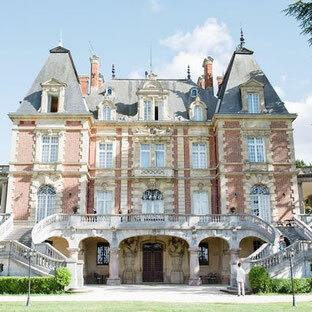 Dreaming about having your wedding reception in a french château ? Well, I understand you sooo well ! I am absolutely crazy about castles, private mansions and « maisons de maître » and every time I visit one of them, I can’t help myself but thinking of a gorgeous wedding it can host. Today, I’m giving away my secret locations and sharing with you some of great venues where you can host a wedding reception of your dreams. Please note, that there are hundreds of wedding venues in a Parisian region, so even if you don’t find your perfect wedding reception venue in this post, no worries ! For all my couples I make an individual research based on style preferences, geographical area and budget. Gorgeous Château d’Ermenonville surrounded by moats and forest will charm brides dreaming about romantic princess wedding. Its panoramic terrace overlooking water on one side and a castle’s façade on the other, will become a perfect spot for an open air dinner. Inside you will find gorgeous stairs for you to come down to meet your fiancé before the ceremony. The only sour note – rooms and suits are not quite modern. Nevertheless, most of them have amazing views. Price, accommodation included for one night (! ), varies from 7000 to 9800€. Huge discounts available if you book during the week (even in the summer time). Great venue and definetely one of my favourites. Princess wedding is not enough for you because you want a Queen wedding? 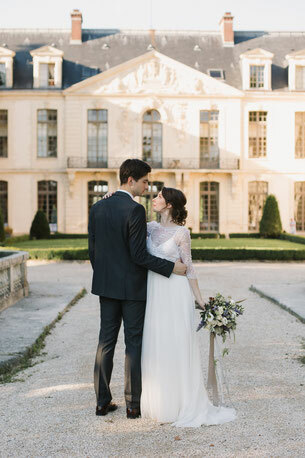 Well, you have just found your perfect wedding venue near Paris! Château de Champlatreux is very impressive. You actually feel yourself royal when you enter this 18th century property, built for a rich and noble family Molé more than two hundred years ago. 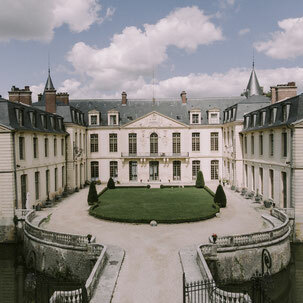 This château has a huge park with a fountain and several ball rooms full of ancient paintings in heavy golden frames. The place is big enough to welcome two hundred guests and believe me, it won't leave anyone indifferent. No sleeping places available in the château, but numerous b&b could be found in the area. Renting prices start from 4900€ per Saturday evening. Another great castle situated not too far from Paris - Château de la Plumasserie. Located 60 km away from Paris (about 1 h drive), it is a real pearl for couples looking for all-in-one solution. 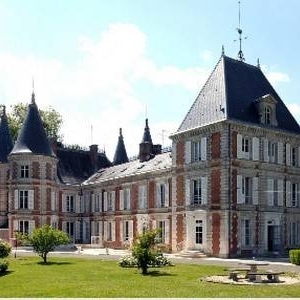 Château de la Plumasserie, build in 19th century on the ruins of a more ancient castle, has a very romantic allure and attracts couples with its dreamy exterior (there is a little pond in the park, ancient kiosk covered with flowers and a small chapel). In case of a bad weather, there is a bright and modern ball room. The venue also offers 15 sleeping places, which is a great commodity. Rental prices start from 5040€ for the whole weekend. More advantageous rates available during the week. 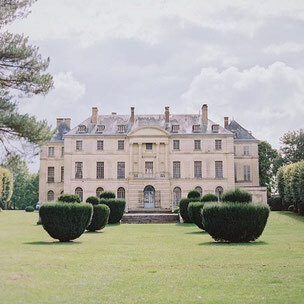 Château de Montgobert is another little pearl hidden between forests and fields of a Parisian region. It is situated 1h30 drive away from Paris, in a quite village and is surrounded by a huge park with trees as old as two hundred years. It also has its own little lake. If you dream of a truly royal wedding and have a limited budget, château de Montgobert is a place-to-rent. It has an impressive entrance, wooden pannelled reception room, but no accommodation. You can still stay in local bed & breakfasts though. This château is so impressive, that I would definetely recommend you to organise your reception outdoors. You will enjoy the gorgeous view on the château and a 2 centuries old park. Prices start at 2900€. 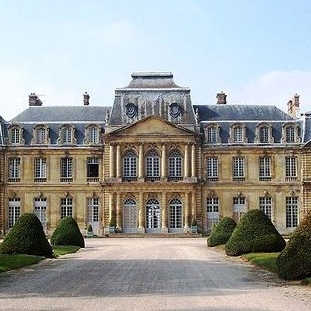 Château de Bouffemont is situated about 30 minutes away from Paris and is highly popular among international couples. It is newly renovated and offers modern comfort together with an ancient charm. It has a cosy dining room painted in white and mint colours and offering direct access to the terrace. For your Mr and his groomsmen, there is a very masculin bar, right next to the ball room - perfect place for whisky or rhum degustation sessions. You will also enjoy two white galleries overlooking the park, where you can have a pre-dinner cocktail or a morning brunch. For your convienience there are around 10 rooms and a master bedroom for you and your husband-to-be. Prices are rather high, from 5000€ to 16 000€ depending on the number of guests and the season/day of the week. You are looking a venue for your dream wedding in France? 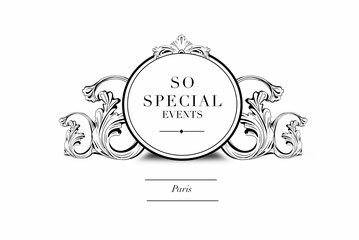 Feel free to contact me by mail at katerina@sospecialevents.com and I will take care of a personalised research for you based on your unique criteria !